Andy Awford has adjusted his focus to local destinations as he seeks to present his Pompey youngsters with loan experience. Bradley Tarbuck’s ill-fated spell at Dartford has been a lesson learnt for the Blues boss. The promising striker headed to the Vanarama Conference side for an initial month’s loan at the end of November. But the Emsworth youngster appeared only off the bench for the strugglers – making four appearances and totalling 68 minutes during a frustrating spell. Tarbuck, who grabbed a double in the reserves’ 3-3 draw at Plymouth last week, is one of a number of players Awford is keen to loan out to aid their development. Jack Maloney is currently at Poole, while the search is also on for takers for Ben Close, Nick Awford and potentially Conor Chaplin. And Awford is keen for temporary homes a little closer to home than Kent. He said: ‘Brad went up to Dartford and it was a little bit of a strange loan if I’m being honest. ‘I thought it was a good choice, they are one league below us, Brad would go and play, hopefully do well and then kick on. ‘But he didn’t play, he didn’t start a game, which is a shame. ‘As it is so far away he wasn’t training with them. So is it worth sticking him in a car on a Tuesday to drive three hours for an hour’s training session? No. ‘Dartford felt it was better he trained with us full-time and I think we have to look at that in the future. ‘If a lad goes to Havant he can train with us and still go there in the evening because it is on the doorstep, as it is at Bognor, Gosport, Woking, Aldershot or whatever. ‘But if it’s a bit of a stretch we have to look at that and make sure it’s right, and that’s the learning curve for us. 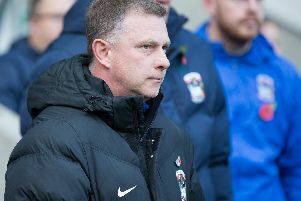 ‘With loaning Brad out again, or whoever else before the window shuts, it’s important for their development and important for the club because it’s getting them vital first-team experience which at the moment we cannot provide because we are doing what we are doing at first-team level. ‘I don’t expect players just to walk straight into somebody’s first team, especially young ones, because you cannot expect that. Tarbuck made his Football League bow in November, coming on as a substitute in the 3-0 Fratton Park victory over Carlisle. It was back in August 2012 when he made his Pompey debut, also as a sub, in the Capital One Cup clash at Plymouth. Still only 19 and having returned from ankle damage sustained last summer, Tarbuck is seeking to win a fresh Fratton Park deal. Awford added: ‘Since Brad’s come back from Dartford he has been a little bit low because it didn’t work out for him, so you pick him back up again. ‘He has never been forgotten about. ‘Brad, like everybody at the football club, needs to be consistent. He doesn’t just walk into the team on Saturday because he scored twice for the reserves. ‘He needs to keep doing it so you say “hang on a minute”, like Conor Chaplin did.